The Springs in Fall * 2015 Photos: Circles of Sugar and Joy « Midlife Crisis Crossover! 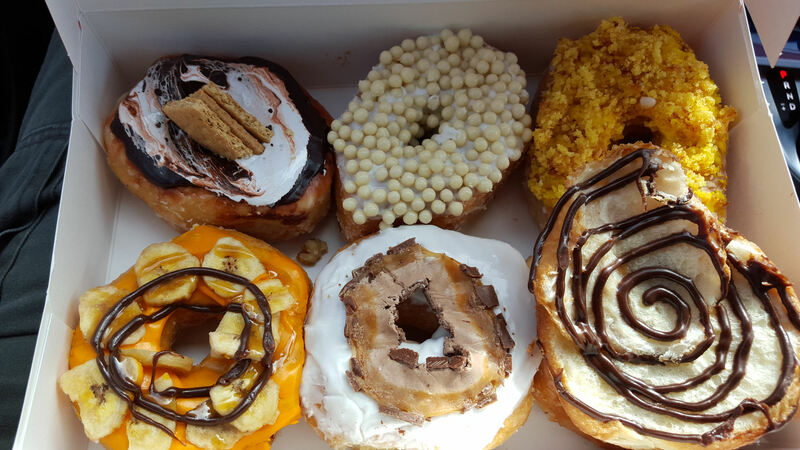 Of all the food we enjoyed during our six November days in Colorado Springs, none made a more lasting impression than these six sweet, intricate, handcrafted circles filled with creative ingredients, sinful carbs, and a heaping helping of love. As I was puttering around the city on the afternoon of Day Five, with less than 24 hours before we had to fly home, it occurred to me that maybe I should investigate whether or not the Springs have any artisan donut shops. Sure, we’ve found the occasional Dunkin Donuts here and there in other cities, but too often we neglect to investigate local bakery scenes. Enter the one and only non-franchise search result: Amy’s Donuts. Top row, left to right: Honey Maid Smores, White Chocolate Pearls, Zesty Lemon. Bottom row: Bananas Foster, Vanilla Milky Way, Chocolate Cronut. Six pastries, six blue-ribbon winners in the county fair of our hearts. Amy’s had literally hundreds of options for toppings and formats. One variety for each of the major breakfast cereals. A long line of cake donuts that were disqualified because I’m not a fan of those no matter how pretty they look. Pastries with meat inside. If I’d violated donut ordering standards and asked for a seventh, the one on the bubble was called Lord of the Pretzels. Maybe next time we’re in town. Even more fun: first thing when I walked in on November 5th, a generous young lady walks up to me, yells “HAPPY NATIONAL DONUT DAY!” and tosses a sack of free donut holes at me. I honestly had no idea. Apparently the people in charge of commercial holidays thought the original National Donut Day in June was such a smash hit that they’ve expanded it to a second day in November. Normally such a calendar change would earn my skepticism, but at least we know for sure Hallmark card sales weren’t their primary motive. And a bag full of free sugar is a great way to silence my skepticism. For the records, I didn’t eat them all at once. I contented myself with some of the holes till my wife got off work that evening so we could divvy them up fairly. All week long she’d had to report to work ridiculously early, even before our hotel’s breakfast buffet opened, and had to subsist each morning on whatever prepackaged snacks she could scrounge up. For her final Colorado Springs shift the next day, I thought she deserved better. Thankfully the lemon and banana donuts did the trick.